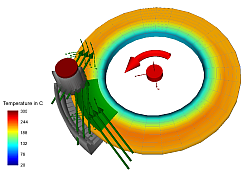 HG "Sep 11 2014", "18:27:15"
The FlexibleBodies Library provides Modelica models to represent flexible bodies as beams, annular plates with optional thermo-elastic properties and modal bodies. The user can define beam-like structures such as the rotor blades shown in figure 1 by simply parametrizing an analytical model of a straight and homogeneous beam considering two-dimensional bending, torsional and lengthening deformations. The same approach is also applied to model the bending behavior of annular plates such as a helicopter swash plate in figure 1. For both model types, a graphical user interface allows the definition of a complete set of complete set of geometrical and physical properties. Figure 2 shows an automotive brake system with a floating caliper. Due to the chosen so-called arbitrary Langrangian-Eulerian description also non-rotating loads such as brake normal and friction forces (visualized be green arrows) and the associated heat flow may be applied in a very convenient way since the contact modelling is substantially simplified. The component ModalBody allows to represent flexible bodies of a general geometrical shape. The geometrical and physical properties are defined by an SID (standard input data) file that is usally generated by an external program. 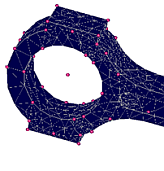 The SID file can be exported from Abaqus directly (as of version 6.10-EF). 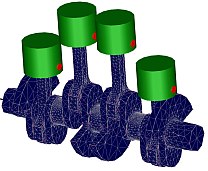 For users of ANSYS, Nastran, I-DEAS and PERMAS, we recommend the preprocessor FEMBS that is capable to generate an SID file from the FE programs. The user of the ModalBody model has to define which SID file is to be accessed to parametrize the body via the Modelica user interface. The SID data of a beam are completely generated by Modelica while ModalBody needs a file. For the application of ModalBody models in real-time environments the SID-data may be converted into a Modelica package so that external file access is avoided. The motion of a flexible structure is defined by superposition of a large nonlinear motion of a reference frame with small elastic deformations. In order to consider initial buckling behavior, stress stiffening and softening effects can be described if supported by the preprocessor. Version 2.1 is available for Dymola. Tested on Dymola 2015 and Modelica Standard Library 3.2.1. We also supply the preprocessor FEMBS from SIMPACK AG. For more information, prices and quotations please contact info@Bausch-Gall.de.